I remember the beginning of the 1980 Championship Season like it was yesterday. I sat on the front porch of the KA house and listened to Larry Munson call the Georgia vs Tennessee game on the radio. 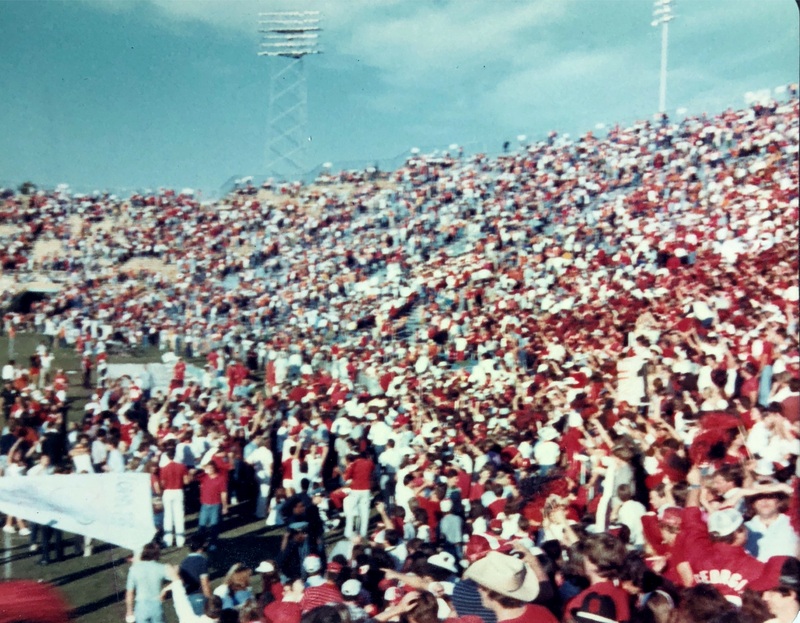 It was the first game of the 1980 season and Georgia was coming off a dismal 6-5 season the year before. Tennessee was favored to win and GA was struggling early on. We students were all hoping that Coach Dooley would play the new running back from Wrightsville, Georgia, but we also knew he rarely played Freshman and was unlikely to do so in such a big game. The match was a slug fest. Tennessee had the home advantage in their HUGE stadium with over 107,000 screaming fans. My friends and I huddled around the radio, listening to Munson’s passionate calls as only he could do. With an anemic running attack, more than once Munson alluded to the possibility (the need) for this new big freshman to get a chance to run the ball, and seemed to be leading the coach through the urgency in his calls. Finally, Coach Dooley put #34 Hershel Walker in the game, and Munson’s voice came alive with an invigorated hope as he emphatically cheered the Dogs on. Munson’s call of Herschel Walker literally running over Tennessee’s all conference defensive back Bill Bates is one that I will never forget, much like the famous “hob-nailed boot” play. When the game was over, Georgia had upset Tennessee by 1 point and there was absolute elation in Athens. Immediately upon the win, I dashed from the porch, running as fast as I could across Lumpkin Street and old campus to the Tower Bell, which was traditionally rung by dozens of students in jubilation at every victory. Because of my haste, I was the first one to arrive and had to climb up the tower to untie the rope. As I did, I swung back down, hanging onto the rope, and was the first person to ring the traditional Bell at the opening of the 1980 Championship season. A few weeks after the TN game, Georgia went in to the GA vs FL game undefeated (having narrowly defeated SC and the eventual Heisman Trophy winner George Rogers the week before). Georgia was ranked number 2 in the AP behind Notre Dame who was playing Georgia Tech the same day. The day was sunny, cool, and the stadium was full of Red and Black and Blue and Orange. It seemed like the entire Bulldog Nation had traveled to St. Simons and Jacksonville in hopeful anticipation hopes of a Georgia victory. The game was hard fought, and within the last minute, Florida took a 4-point lead with a late, spirit-crushing touchdown. There were now only about 45 seconds to go as GA took the ball. Feeling down and hopeless, I will always remember the next few moments of Bulldog history. I was in the corner of the end zone furthest from where Georgia was playing offense from their own 9-yard line. Suddenly, quarterback Buck Belue scrambled to avoid what could have been a game ending sack, and then made an incredible 20-yard pass to Lindsay Scott. Scott caught the ball, floated horizontally across the middle of the field, and began what was an 80-yard foot race all the way to the end-zone - directly in front of where I was sitting. Along with all the other elated GA fans, Larry Munson was yelling and jumping so excitedly he actually broke his chair. It seemed like time stood still; the Georgia fans left their feet and did not return to earth as we celebrated that game-winning touchdown pass – it was a moment of excitement in Georgia Football history rarely to be rivaled –what a blessing for me to be present at such a memorable time. This year week, we get to watch in anticipation another great Georgia team battle Florida for a chance to play for the Southeast Conference title. Each new match up brings the possibility we could witness yet another great moment of Georgia football history. So before you go to the game, pull together with your friends and family and get fired up by listening to some of Munson’s greatest calls. Have dinner with your best friends buds. Enjoy the excitement of the anticipation of a victory. The love of the game is deeply rooted on St. Simons Island – I encourage you to breathe it in and make some of your own wonderful memories. Specializing in Coastal Georgia Homes, Land and Investments, Page Aiken has a dedicated focus on Sea Island, St. Simons, and luxury development sites along Coastal Georgia. His Team leverages local knowledge and Engel & Völkers International marketing expertise and global footprint to capture the highest value for every client that they serve. Page is a seventh generation native of St. Simons Island, Page grew up on Sea Island and St. Simons and has been a top producing Realtor for over 30 years.